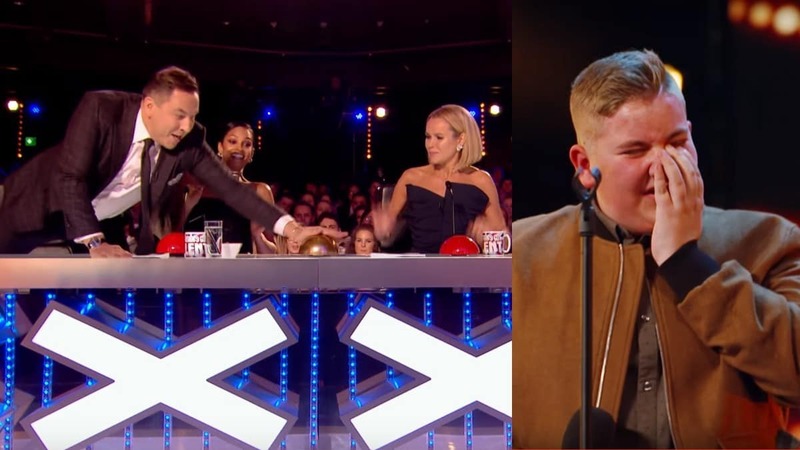 David Walliams presses Golden Buzzer on Britain’s Got Talent 2017 for Sheffield lad Kyle Tomlinson, who he’d said needed “singing lessons”! Luckily, it worked out alright in the end! 15-year-old Kyle Tomlinson from Sheffield returned to the show, a few years after first auditioning. And it turned out that in his previous appearance, judge David Walliams had been pretty harsh on the singer – telling Kyle that he needed more practice and to book some singing lessons! But Kyle was here to prove David wrong and sang an incredible cover of Leonard Cohen’s ‘Hallelujah’ that wowed the audience and had all four judges on their feet! In fact, the performance was *so good* that David reached across the table and hit the Golden Buzzer – sending Kyle straight through to the live semi-finals! Get in! When Kyle had stepped on to the stage, David was shocked to learn that he’d been a bit mean to the young singer in the past. A nervous Kyle explained that he when he came on the show a couple of years ago, he “got told to get a singing teacher” by the popular actor and children’s author. Now, it’s usually Simon Cowell who’s known for being brutally honest, not David Walliams! Though it made it even sweeter for Kyle when David was the one to press the Golden Buzzer. Each of the four judges, plus hosts Ant & Dec, are allowed to select one performer as their Golden Buzzer act each series, sending them straight through to the live semi-final shows without having to go through further rounds. Kyle’s audition definitely proved the old saying ‘if at first you don’t succeed, try and try again’! We’re excited to see how he gets on in the semi-finals! Britain’s Got Talent is on Saturday nights at 8pm on ITV. Love David Walliams? Check out World’s Worst Children 2!